Published in the U.S. as Frozen Assets and in the U.K. as Frozen Out, Quentin Bates's new crime novel set in Iceland is evidently the first in a series featuring Sergeant Gunnhildur, a uniformed police officer in charge of the station in a small fishing town. Though Gunnhildur is a widow who refuses to talk about her husband and is now the single mother of a teenage girl and a young man (out at sea on a fishing vessel), she has little of the grim outlook of the main character of Arnaldur Indridason's Icelandic series and less of the "ordinary-life," almost cozy character of Yrsa Sigurdardóttir's. Bates is English, but has lived in Iceland and has also been a journalist for a commercial fishing magazine, both certainly qualifications for the job of bringing Gunnhildur's setting to life. 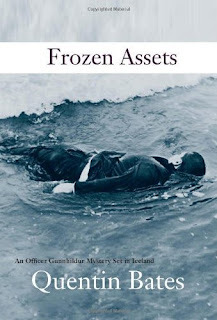 The novel is first a straightforward police procedural, with "Gunna," as she is frequently known, dealing with her superiors in Keflavik and Reykjavik, her diverse colleagues in Hvalvik, and a drowned man who is found along the docks. Her superiors want the case ruled a suicide, but Gunna thinks there's more to it and pursues it doggedly to its roots in a Rekjavik P.R. agency, an aluminum plant and a power plant in her own neighborhood, and an anonymous blogger who seems to know too much about the private lives of some politicians, P.R. folks, and the financial shenanigans behind the construction projects. And lurking behind it all is what some of the characters fear (and the reader knows is looming), the Icelandic financial meltdown. Fans of police procedurals as a genre will be with Gunna all along, and thriller fans will be engaged by the time the plot gets into high gear in the last half, after Gunna has discovered who's behind the death (and some others) and is in hot, but frustrating, pursuit. And increasingly as the plot moves along, we are in classic noir territory, as the corruption at the top of government and business throws sand in the gears of the investigation. Wisely, though, Bates keeps the focus on the street level investigation, rather than moving into the corridors of power. The story stays at the level of the ordinary policewoman rather than reaching into political-thriller territory, and we see the effects, rather than the closeup activities, of the corrupt hierarchy. Also interesting is the penetration of the blogger into the plot, in terms of periodic posts, and the young journalist who is shadowing Gunna for a story on rural cops. All the elements mesh smoothly and enjoyably, and every time the story seems to be heading for a cliche, Bates steers away into something more interesting. While the gloomy intensity of Indridason's novels is not present here, Bates's book is more vivid, to me, than Sigurdardóttir's: livelier and more noir, somehow, at the same time. I'm curious whether readers find the U.K. or the U.S. title and cover more appealing. Votes, anyone? I think the U.K. cover is more graphically interesting, but the U.S. cover has a certain retro-noir appeal that I actually prefer (Soho Crime, the U.S. publisher, does a good job with covers). Excellent review, as ever, Glenn. I think you make a very good point in that one of the strengths of the book is that it keeps the "street level" perspective rather than going into top-level conspiracies, which are rarely very satisfying (well, not to me anyway). Interesting question about the covers. I reviewed this book for Euro Crime so only saw the UK cover which is artistically good but I think too sensationalistic and not reflective of the novel. The US cover is nicely composed but something of a "downer". At least it does not feature snow, a real cliche of Scandinavian crime fic covers. I also agree with your point about the positioning of this novel vis a via Indridason and Sigurdardottir, by the way. Have you tried Michael Ridpath's Where the Shadows Lie, also Iceland-set? 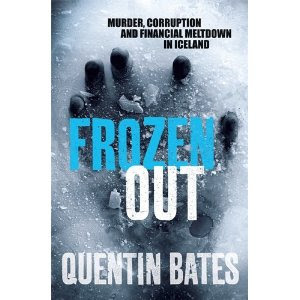 This is yet another type of Iceland perspective - more toursity (sagas and volcanoes) but an enjoyable light thriller. 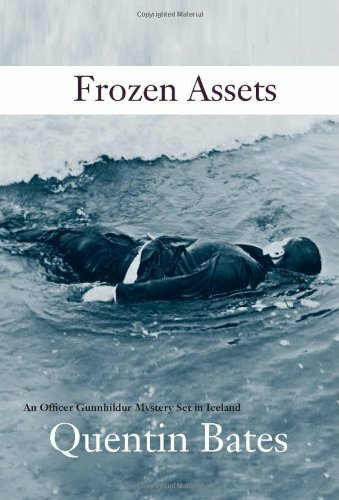 The author is English but the protagonist is a US cop of Icelandic origin who is sent to Iceland to advise on violent crime, but is immediately plunged into investigating one. Maxine: Thanks for the comment--I haven't seen Ridpath's book yet, but I'm hoping that someone will pick up the Icelandic crime series by Árni Thórarinsson, whose novels are popular in France (in translation of course). They focus on a journalist and sound quite interesting.